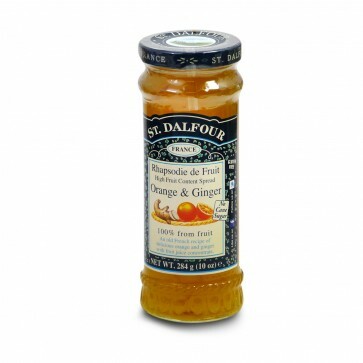 Gorgeously intense orange and ginger by St. Dalfour. Gluten free and a perfect accompaniment at breakfast and afternoon tea. Ingredients:Unsweetened Grape Juice Concentrate, Oranges(17.5%), Ginger (17.5%) Lemon Juice, Gelling Agent (Pectin).